The Balfour Declaration changed the course of modern Jewish history in 1917. It was the beginning of a new chapter. This is what the famous rabbi Jonathan Sacks writes in the Jerusalem Report of Nov. 13, 2017. One hundred years ago! Never had the Jewish people ceased to dream of returning to the land of their ancestors, Shivat Tzion. Because of the book of the British novelist George Elliot “Daniel Deronda” in 1876, it were Christians that felt that soon a new time would arrive and that the Jewish People would return to Zion. Twenty years later there was the first Zionist conference and this changed the dream into a political program. This led to the return actually taking place. Theodor Herzl brought about this revolution. The Balfour Declaration made this change possible. It was a courageous, historical transformative action. It was a grand gesture because Israel had been an administrative district since Roman rule and the First World War. The district of Israel was located within Christian empires, Muslim empires and ultimately the Ottoman Empire. Israel had never been a State. As a result of WWI, there was a realization that countries were giving back to the original owners and so did Israel. It was an anti-imperialist gesture. While countries such as Syria, Lebanon, Iraq and Saudi Arabia became artificially formed States, it was only Israel that really had a historical right to a State in the Land of Israel on the basis of the Biblical State. While Israel had been a State and people for thousands of years from the time of the Judges until the Second Temple period, establishing the State of Israel would be the restoration of a historical people in a historical homeland. Israel became a place of protection for the Jewish people. How many could have been saved during the Holocaust when the borders in the homeland would have been open? Because of this terrible tragedy, it became clear that a homeland was needed for the Jewish people. Rabbi Jonathan Sacks gave these three points. There is a war going on from the PLO, which uses the Internet to achieve its goals. 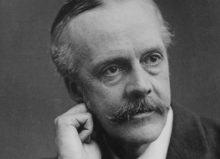 It has now led to 13,637 Britons signing a petition calling for “apologizing to the Palestinians for signing the Balfour Declaration in 1917. This internetprocess was stopped in June 2017 by the proclamation of elections in England by P.M. Theresa May. Abbas was the man behind Yasser Arafat and to this day Fatah and the PLO fully honor this text in their fight against Israel and do not tolerate Israel in the midst of 22 Arab States and 56 Muslim countries. The Millennials, (youth born from 2000) often receive their news from friends and tweets. It is easy to influence them with a tweet such as: “Why did England give away Palestinian land to European Jews?” This distortion of history can easily metastasize, and this signing action has recently been achieved. Let us use the above knowledge in our social circles that we are part of to point people to the distortions of truth. In Zechariah 14: 3-4 it is written about the final battle: “Then the Lord shall go out to fight against those nations, as He formerly fought in the day of battle; his feet shall stand in that day on the Mount of Olives, which is before Jerusalem on the east side; then the Mount of Olives will split in the middle, … ” Our choice for Israel and Jerusalem is good and wise. How old or young we are, we can do something. Esther and Mordechai also did not keep quiet. Happy Purim!